This short video shows that the price of oil you see on TV is far from what Canadian Oil Producers receive. As a basis for comparison we used Western Canadian Select (aka W.C.S.) which is a blend of several oils that is about 20% lower quality than the North American Standard oil West Texas Intermediate (aka. W.T.I.). If you want more information on what the different types of oil are and what they are worth, see our article: Oil isn’t Oil: What Are The Different Types of Crude Oil? IMPORTANCE: 98% of Canada’s ‘proven oil reserves’ are in the oil sands and accounts for a massive 10% of Canada’s Gross Domestic Product. WCS is mostly tar/oil sands oil so it is very thick and expensive to extract and transport. WHERE IS IT PRODUCED: WCS produces in the Alberta’s and Saskatchewan’s Oil Sands. The average cost of transporting of WCS from Alberta, BC and Saskatchewan to U.S. refineries is about $15/barrel and the cost to extract and blend WCS is about $18/barrel. That $18/barrel figure used to be 50% higher but the 2015 global downturn in oil forced the industry to become much more efficient. It is important to note that these graphs will vary for each producer but this very short video will give you a solid sense of how the industry has fared from 2017 to 2018. In addition to producers having higher or lower costs they may have locked in higher or lower transportation costs and sale prices by ‘hedging’ or negotiating long term contracts. It is also worth noting that a not insignificant percentage of Canadian oil producers are happy (ok… happy may not be the best word) to lose money on the raw material costs of oil because they are vertically integrated. They can make much higher profits on their refining and retailing business when raw extraction and blending costs are so low. 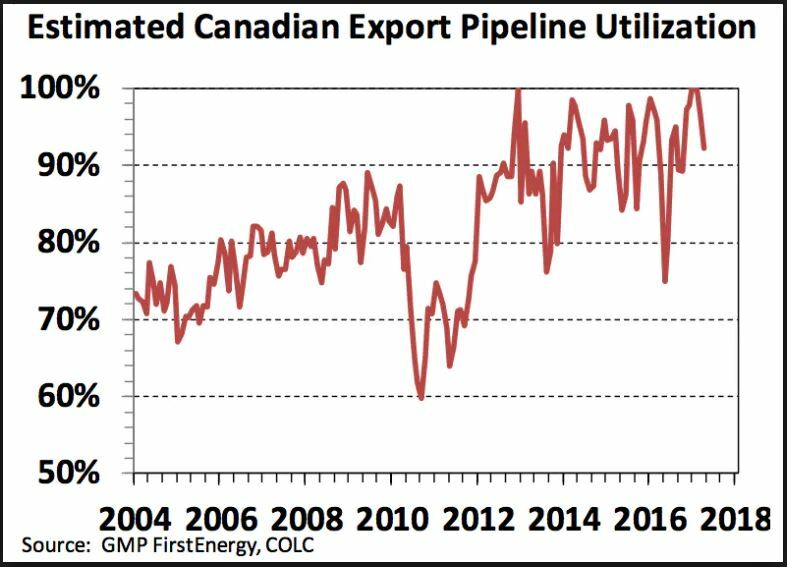 Canadian oil producers say that the reason for this recent gigantic drop in WCS pricing is based on storage and transportation (trains and pipelines) having no additional capacity. As a result oil producers cannot get their product to refineries. Even a small oversupply will causes drastic prices reductions because there is just nowhere left to put it.